Dr. Kevin Sharp has been in practice since 1988, following his graduation from the Los Angeles College of Chiropractic. He practiced in Southern California for six years, making a move to Winston-Salem in 1994. Since that time, he has offered the natural healing of chiropractic care to our community. Cold laser therapy is also available, which can give remarkable results to even the most complex of health concerns. Our patients range in age from teenagers to adults. With years of experience, Dr. Sharp is well-versed in assisting people experiencing a variety of issues. He has been recognized for his achievements many times in the last three decades, and is a well-known speaker and advocate for chiropractic patients with insurance companies. His greatest passion, however, is shown every day in his patient care. One of Dr. Sharp’s memorable patient stories involves a father of two children who had lost function of his legs. An airline mechanic, he could no longer work, and doctors simply could not determine the cause of his problem and instead prescribed medications. He arrived in a wheelchair and for the first month of care, had to be assisted onto the adjusting table. During the second month, he came to the office on crutches. After that, he walked in on his own and has been living his normal life ever since. Another patient was a woman who was heavily medicated due to chronic headaches. These pills left daily life difficult, and she sought Dr. Sharp’s help as a last resort, feeling as if all hope was gone. Today, she is pain-free and no longer needs medication. 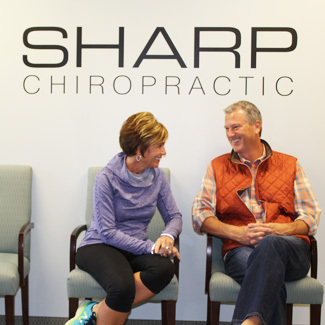 The entire team at Sharp Chiropractic is dedicated to affordable, high-quality care and visits with little to no waiting times. Our busy practice has a positive reputation after years of open patient communication, no sales pitches and working with you to achieve your goals. Contact us today to schedule your time at our chiropractic care center. Your insurance coverage can be used for your appointment.